I met John and Cathy when we started doing the Cube of Truth in Romford. Cathy had been vegetarian since the age of four (!) with John converting shortly after they got together and have now been vegan for a few years. John and Cathy take part in activism events ranging from the cubes, save vigils, protests at London Fashion Week and even braved the rain to attend the one year anniversary of Canada Goose opening in London so they could commemorate the animals who have died to make the garments purchased since it opened last year. “On Friday evening me and my husband John visited Unity Diner in Hoxton for the first time. The staff were extremely friendly and offered to go through the menu with us. We were seated in a very nice spot by the brilliant art work on the wall. We were pleased to see they had an alcohol licence so we ordered two glasses of sauvignon blanc which was very nice. For starters we wanted to order the seitan chick’n wings and the cauliflower wings, but they had run out of the seitan so we went for tofish bites instead. Both were very nice and the cauliflower came with coleslaw and ranch mayo. The tofish came with tartare sauce, we both slightly preferred the cauliflower. For mains John ordered the Surge burger with extra cheeze, bakon and chunky fries. I ordered the mixed leaf salad with potato wedges. The burger was massive and very tasty and the fries were nice and crispy. My salad was lovely and the dressing was very good, the wedges were full of flavour and came with a basil mayo. We also tried their hot sauce which is not for the faint hearted and comes with quite a kick! For dessert John had the cheesecake which was absolutely delicious and I had an ice cream sundae with strawberry and yuzu and pistachio crunch with whipped cream. We had a very nice evening, totally recommend it but make sure to book to be sure of gettinf a table. We will definitely be going back to try the rest of the menu as the loaded fries look amazing!!! Well doesn’t that all sound fabulous? I’ve been eyeing up the weekend menu which includes chick’n and waffles as well as pancakes. Have you been to Unity Diner? 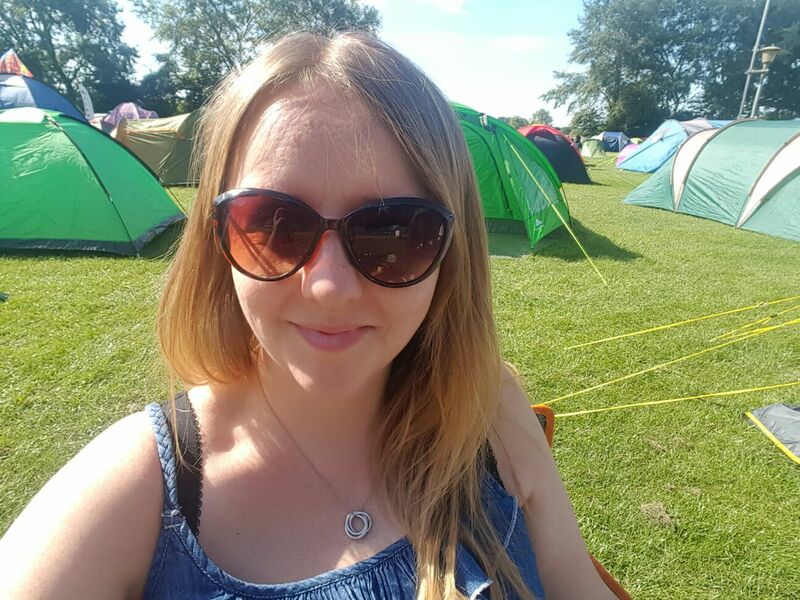 Or have you been somewhere else I haven’t featured on the blog yet and would like to do a guest blog like Cathy? Let me know in the comments below. 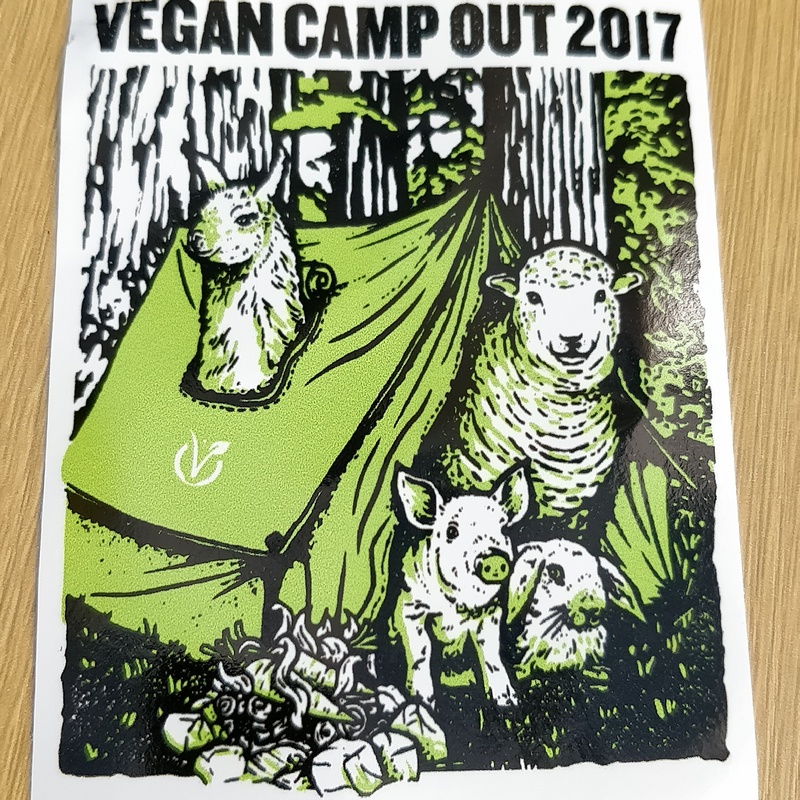 On Friday my Sister-in-law Gemma and I headed up to Nottingham for the Vegan Camp Out. Unfortunately it took us a bit longer than expected due to traffic but we made it there before nightfall and worked as a team to get the tent up! 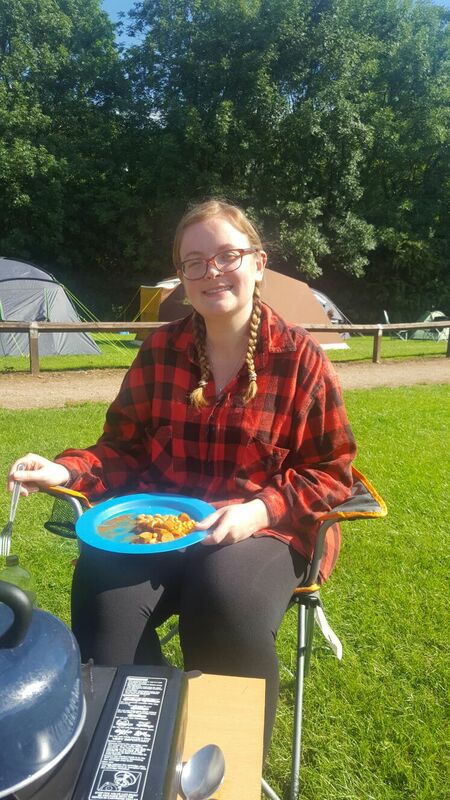 This was my first time camping ever (!) 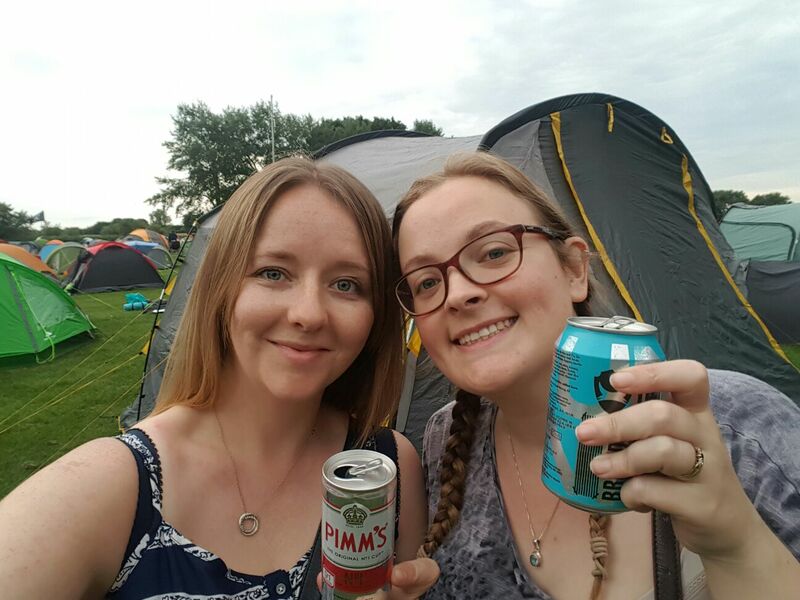 so you can see how proud I am celebrating with a can of Brewdog Punk IPA in front of our tent! We headed over to the main tent to watch Carl Donnelly’s set. I have been aware of this vegan comedian for a number of years and follow him on Twitter so it was good to be able to watch him in person. He was very funny and recounted vegan experiences the audience knew all too well! After that we wanted some food. There were only 4 stalls serving food for over 2000 people (!) But after a 1 and a half hour wait we got our chomps around some battered sausages and chips from Battered. By this time it was dark and we were so hungry there wasn’t time for a photo! We went back to the tent to get some shut eye but unfortunately we had some very noisy neighbours (from other reports a lot of the campers were of the partying in the small hours variety!) so I didn’t have a great night’s sleep. 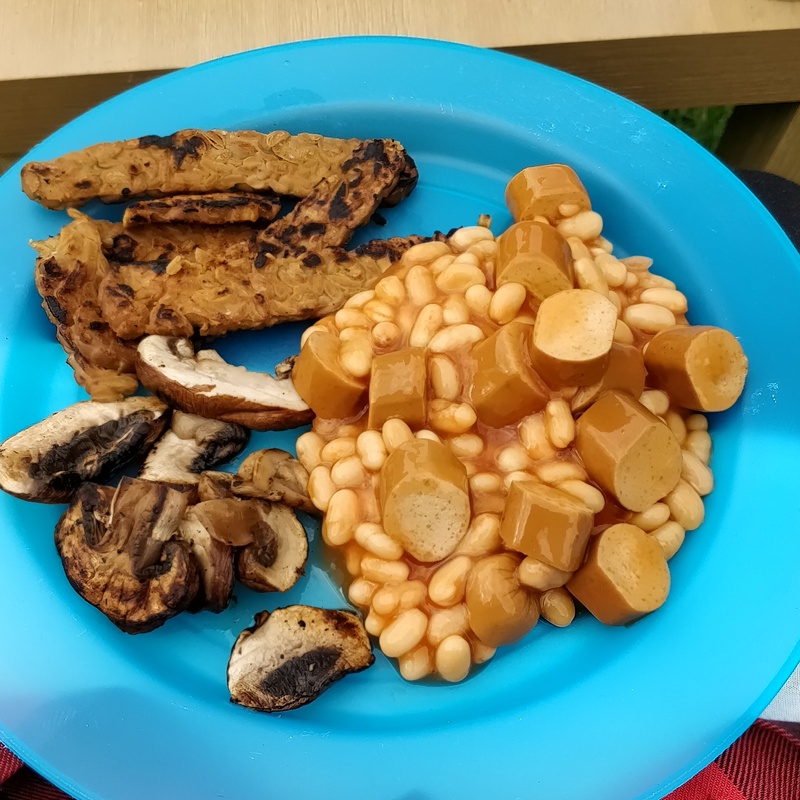 In the morning we had a cooked breakfast on the camping stove to give us some energy for the day. After that came the washing up before we headed over to the marquees for some talks. We listened to Earthling Ed who I had recently followed on Facebook who gave some insight into activism, then I saw a talk and Q&A from a man from Nottingham Hunt Sabatours. It was really interesting and something I want to look into a bit more. 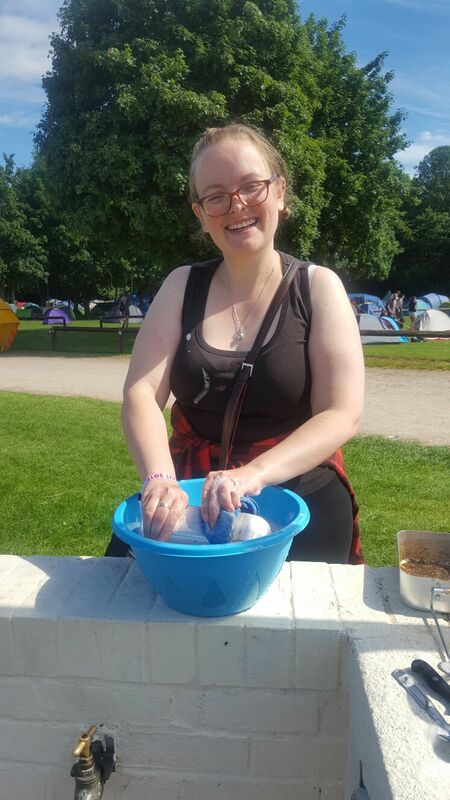 After a nap in the tent we took part in a workshop on toxic masculinity and veganism, which again was very insightful and an area I am very interested in. As we had a bit of a gap before the next thing we wanted to see we thought we’d brave the dreaded food queues! We decided to split up with me tackling the pizza queue and my Sister-in-law tackling the doner one. I got chatting to a couple of ladies from Manchester and I’d even been on the same greyhound protest with one of them in January! This time it took us an hour to get our food so we headed over to the main marquee to hear Juliet Galletley founder of Viva! speak and introduce the film Swine about the pig industry. 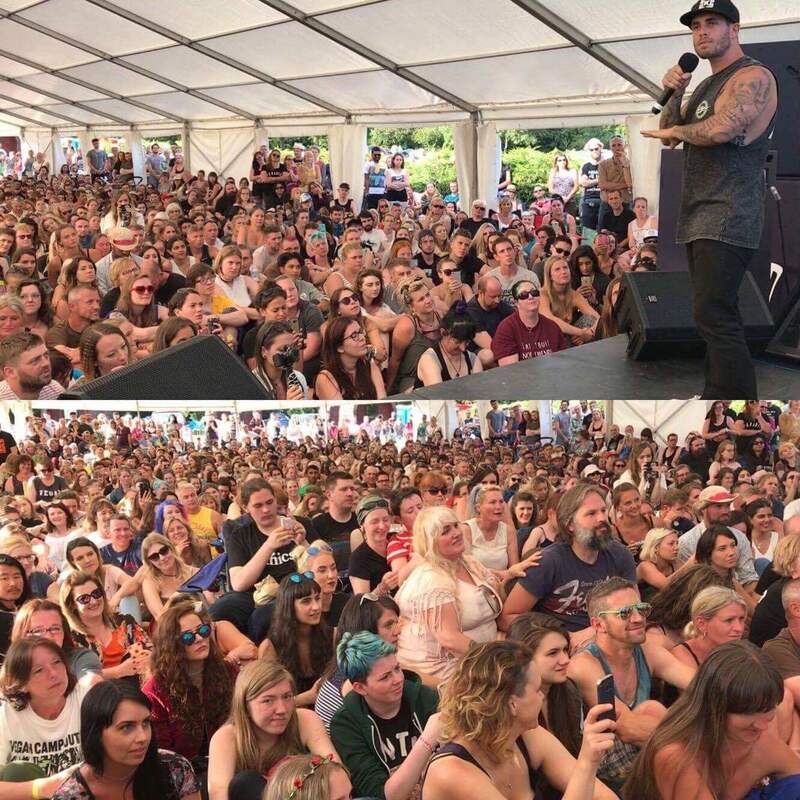 After that we all huddled in the tent to see who I think was the most anticipated speaker of the weekend, James Aspey. I had never heard of him before although my Sister-in-law and I had noticed him (wink) earlier in the day walking around. He had a great way of speaking and telling his story and I would recommend you Google him as soon as you’ve finished reading this blog! Afterwards we headed back to the tent and had some drinking fudge from Fudge Kitchen that we had bought from the Viva! stall. It was delicious! All in all we had a fab time. We met some lovely people including a couple who are soon to be living very close to me! There were a few hiccups but the organisers seem to be taking all the feedback on board from what I have seen. This is only the second year of this event and I am really grateful to them for organising it. 2018 promises to be bigger and better and tickets are already on sale! 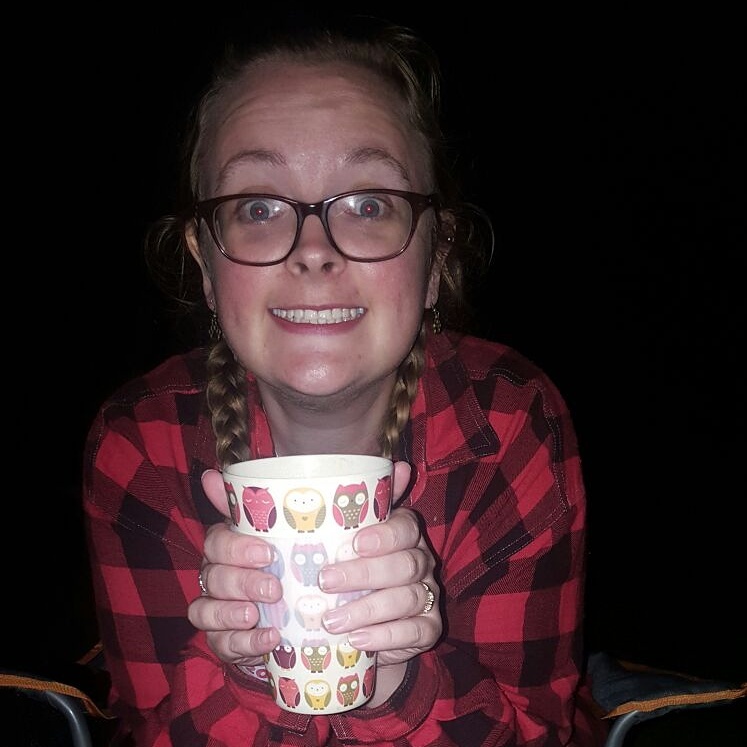 Did you go to the camp out? What did you think? Would this be something you’d be interested in? Let me know in the comments.